L 16″ (41 cm) W 43″ (109 cm). Description: Sexes similar. 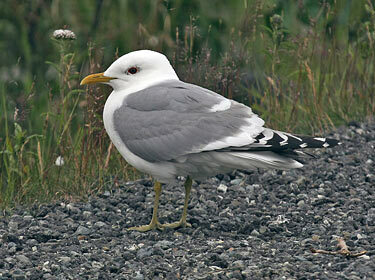 Breeding adults show white head, dark gray back, primaries with black and white tips, small yellow bill and legs, and large dark eyes. 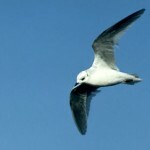 Winter adult is similar to breeding adult but has brown wash on head. Second winter bird like winter adult but has yellow bill with dark tip. First winter birds are heavily washed with brown below and have brown wings. Juvenile is brown overall. 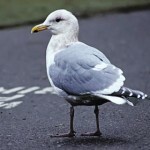 The Mew Gull plummage is similar to Ring-billed Gull, but slightly smaller in size. Habitat: Near rivers, lake shores, and seacoasts. Where in Nebraska: Accidental. Two sight records in 1996 at Lake McConaughy. 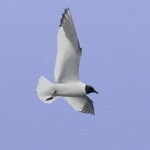 Fun Facts: One of the smallest of the “white-headed” gull.